Against the Pittsburgh Penguins, Benoit Pouliot will make his return to the Edmonton Oilers’ lineup. After taking a nasty fall in practice and missing nearly a month with an undisclosed injury, he’s excited to hit the reset button and start with somewhat of a clean slate. He’s hoping his time away from the team will be the refresher he needs to get his game back on track. The idea of a reset is a storyline that reaches beyond Pouliot in tonight’s contest. Former Oiler Justin Schultz will be making his return to Edmonton as part of the Penguins defensive core. To say Schultz has had a rebound season with the Penguins would be an understatement as he comes into the game with 45 points in 62 games, leading Pittsburgh’s blue line in points and a plus-28 on the positive side of the ledger. He’s not the Schultz Oilers fans remember when he last wore the orange and blue. Maybe it was then-General Manager Craig MacTavish saddling him with “Norris Potential” expectations. Maybe it was the disappointment over the fact that he seemingly wasn’t developing into that number-one guy he was projected to be. Maybe it was an unrealistic hope that he could somehow succeed despite what was going on around him. It could have been all of those things that contributed to his lackluster tenure in Edmonton. In Pittsburgh Schultz was acquired with less expectation placed upon his shoulders. He had an opportunity to play a lesser role, ease his way in and when the time came to elevate his level of play, he was able to do so. The Oilers are hoping Pouliot can do the same considering he’s one of the few players on this roster with any real playoff experience. Unlike Schultz, Pouliot isn’t starting over with a new team and he isn’t exactly getting a completely clean slate. With the trade deadline having come and gone, his absence from the lineup less than noticeable and the Oilers still firmly entrenched in a playoff push, Pouliot will return without the expectation he’ll need to be a difference maker. So too, with players nipping at his heels to get into the lineup, he’ll have a short leash. But, to kickstart his efforts he’ll also have new linemates. Pouliot will skate alongside newly acquired — but former teammate in Montreal — David Desharnais as well as the always gritty Zack Kassian. The expectation is to simply contribute. We’ve got to face facts, he’s struggled this year to this point. Perhaps this break will allow him to reset a lot of things and to get himself going. Do we expect him to be at the top of his game without having played in three weeks? No. But we want to see an energized individual come back. If he can get his game back and build it for the last 7-8-10 games at least we’ll get something out of him. These are not the words of a coach who’s expecting Pouliot to become a world beater. But, to Pouliot’s credit, he understands his need to be better. 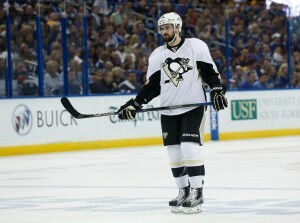 “It’s a time to redeem, to play well and get back to what I’m supposed to do,” said Pouliot. 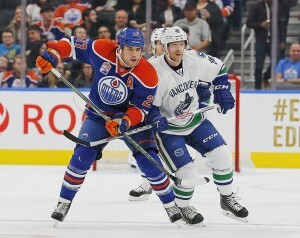 While the expectation may be to see if a reset will work and allow Pouliot to contribute more steadily is all the Oilers may be looking for, the hope is that Pouliot starts to turn up the heat at a time the Oilers could really use his experience. When it comes to the playoffs, few Oilers on this roster can say they’ve been there and done that. Of the regular skaters on the current roster, their combined playoff experience is limited to a total of 306 contests. Milan Lucic leads the way with 101 playoff games and Pouliot comes in second with 54 games — more than half of all playoff games between those two players. Edmonton could use a Pouliot that is offering more than the three points in 25 games he offered before going down to an injury. The Oilers are looking for a Pouliot who can offer what’s he offered in the past. Nothing more. Perhaps a reset or a clean slate will allow him to do so.